Malaga is located in the southern part of Spain on the coast of the Mediterranean Sea, known as Costa del Sol (the Sunny Coast). It is one of the eight regional capitals of Andalusia and the biggest coastal city in the south with approximately 600,000 inhabitants. The town is located near Sevilla and Granada and the strategically good position in the Mediterranean Sea makes it easy accessible from the Sea. 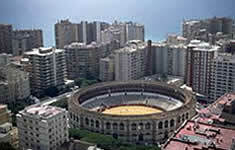 The most important industrial sectors in Malaga are the agricultural and the tourism industry. The climate, with more than 300 days of sun and a year around average temperature of 23ºC (73ºF), makes Malaga a perfect location to grow olives and fruits like lemons and oranges. The perfect weather in Malaga together with the many beautiful beaches in the area make the province one of the most popular places for tourists to visit in Spain. Apart from the above sectors Malaga town has the second largest industrial port in Spain and it also has an important production of textile and alimentary products. The town of Malaga is a very fascinating town with a rich and unique history (see history of Malaga), which gives visitors a great variety of interesting things to do and see. Apart from all the cultural attractions, Malaga is a perfect location to enjoy life. The relaxed Mediterranean atmosphere and the perfect climate have during nearly half a decade attracted many foreigners (both tourists and foreigners settling down in Spain). The people in Malaga, called Malagueños, are known for going out a lot at night for a chat, a drink or to eat out. The town therefore has a great variation of restaurants, bars and bodegas, which normally are busy throughout the week. The Malagueños are also known for loving everything about their town and they are particularly proud of their two world famous citizens, the painter Pablo Picasso and the actor Antonio Banderas.